Description: The second book in the Explorers series has more mystery, more bravery, more danger than ever before! The perfect read for fans of The Name of This Book Is a Secret and The Mysterious Benedict Society! Reader! We have left things unresolved! What began as your average story of a boy stumbling upon a secret international explorers society has turned into an adventure of epic proportions. The average boy--Sebastian has been kidnapped by a trio of troublesome thugs who want the secret map he's memorized. Luckily, his new friend Evie has promised to rescue him, and double-luckily Evie has the famous explorer and former Filipendulous Five member Catherine Lind at her side! There's still the whole matter of Evie's grandfather (and the leader of the Filipendulous Five) somewhere out there in grave danger, but pursuing Sebastian will lead Evie and Catherine to another member of the Five, who might be able to help. There will be new people to meet, new places to see, and some dancing along the way. And one amazingly reckless rescue. 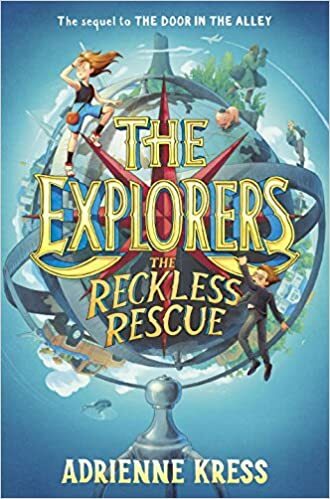 My Thoughts: THE RECKLESS RESCUE is the second book in the Explorers series. It begins with Sebastian in the hands of his kidnappers while Evie is trying to convince the Explorers Society to mount a rescue. She and Catherine Lind are authorized to rescue Sebastian while trying to locate Evie's grandfather. Sebastian has been kidnapped because he has a photographic memory and has memorized the key to a map that Sebastian burned to keep it out of the enemy's hands. The Filipendulous Five made an amazing discovery that the enemies want to find and exploit. Evie's grandfather was the leader of the Five. He sent letters to other four which give clues to his location. But he really, really liked riddles and so the clues are obscure. Evie and Catherine have Catherine's letter but have to track down Benedict Barnes - another of the Five - who is currently exploring the Vertiginous Volcano off the coast of Australia to get his clue. However, the location of the volcano is secret and Evie and Catherine have to reunite a couple of Great White Sharks before they can convince a guide to take them there. Meanwhile, Sebastian escapes from his kidnappers in Seoul and falls in with a K-Pop band named the Lost Boys to get away from them. He wants to contact his parents but the band's manager doesn't believe that he is not a runaway boy and thwarts him. The manager wants Sebastian to stay with the band so that he can take care of him. Sebastian and the band come up with a plan but it requires him to learn to play the drums and perform at one of the Lost Boys' concerts. He gets away from the Lost Boys but is recaptured by his kidnappers. Evie and Sebastian reunite at the Vertiginous Volcano where they have a hair-raising adventure crawling through the volcano to get away from the kidnappers. When the story ends they have two pieces of the clues needed to find Evie's grandfather and two of the Filipendulous Five to help them track down more members. This story had a cliffhanger beginning and a cliffhanger ending and lots of adventure in between. I loved the footnotes and the general writing style and can't wait for more adventures. "Evie, please, stay calm," said Catherine, jumping into the conversation. Evie scowled at that. Had there ever been a person in the history of time who had been told to stay calm, or to calm down, or any kind of calming where the result had been anything other than the person getting more frustrated?